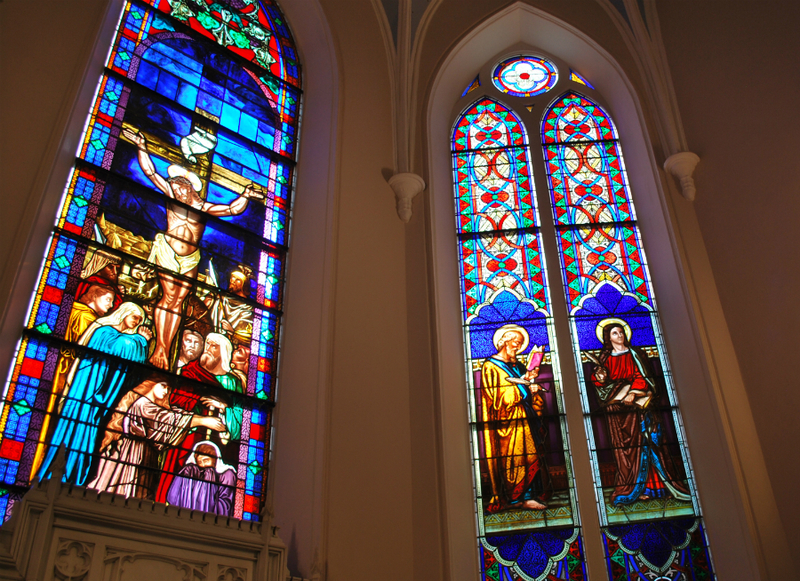 St. Matthew's Lutheran Church - Productions Unlimited, Inc. | Productions Unlimited, Inc.
St. Matthew’s Lutheran Church purchased its present Charleston site in 1868 and the sanctuary was dedicated in 1872. It was first renovated in 1925 with the installation of an elaborate Gothic marble altar and addition of a five-stop chancel organ. A second renovation was required after a major fire damaged the church in 1965. 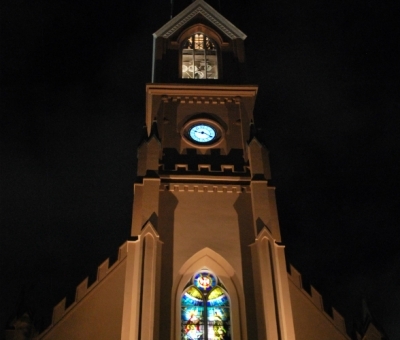 The church’s steeple is the highest in the state at 255 feet. 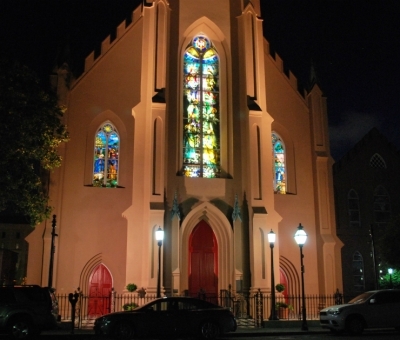 St. Matthew’s is listed as an exceptional contributing property of the Charleston Old and Historic District and is a contributing building in the Charleston National Historic Landmark District. 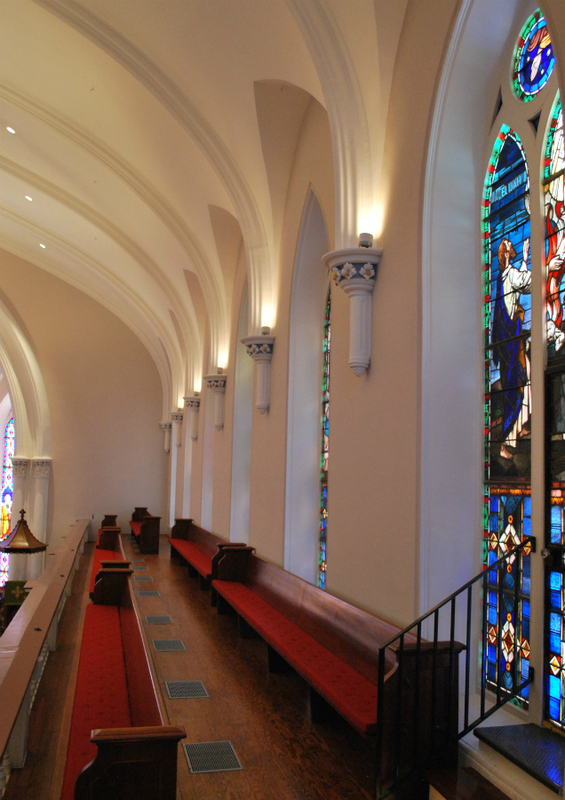 Realizing in 2010 that they needed another major renovation, the church contracted MCA Architecture, Inc. and Burdette Engineering to oversee the project. 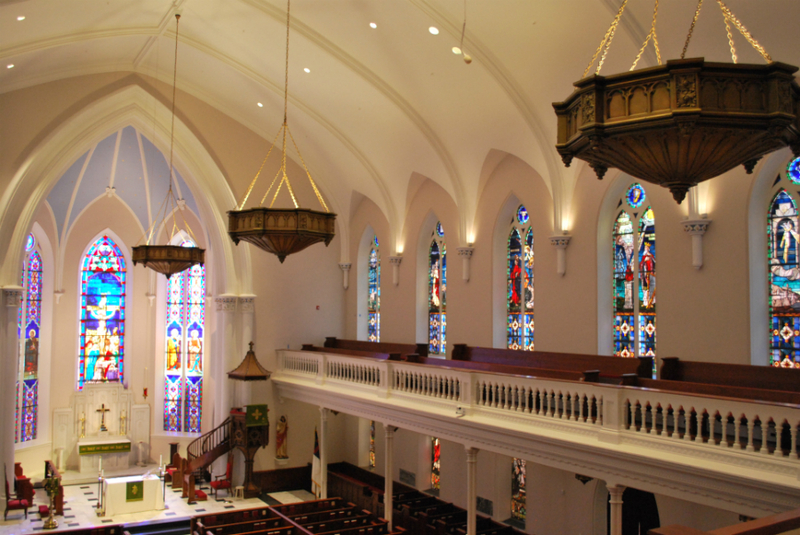 In turn, these two firms approached Productions Unlimited, Inc. to begin discussion about refitting the lighting as well as the chandelier and Advent wreath rigging systems. 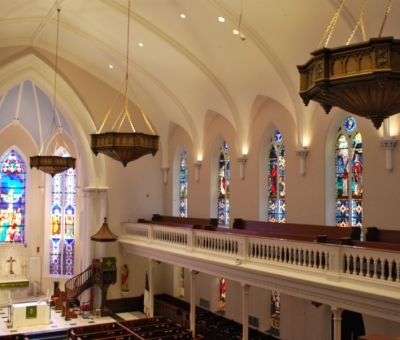 For the chandelier rigging system, a much safer Prodigy motorized rigging system from ETC was chosen to replace the older hand-cranked winches used to raise and lower the church’s three large goblet chandeliers (eight feet wide and over one hundred pounds each). The installation of the Prodigy unit required a custom mounting bracket and custom pulleys, which allow the operating lines for each chandelier to move through the attic space uniformly without interfering with the existing structure. A custom double purchase crane style block was designed specifically for this project. In concert with right and left lay wire rope, we were able to prevent the chandeliers from rotating. A custom foam cap was molded for each chandelier cable to complement the existing trim at the ceiling peak, where the operating wire rope lines connect to a decorative gold chain that holds each chandelier. A chain motor was installed to raise and lower the church’s Advent wreath. Both the chandeliers and the Advent wreath can now be adjusted with the touch of a button. Productions Unlimited, Inc. was chosen primarily to upgrade the existing lighting system with state-of-the-art LED fixtures and architectural controls. 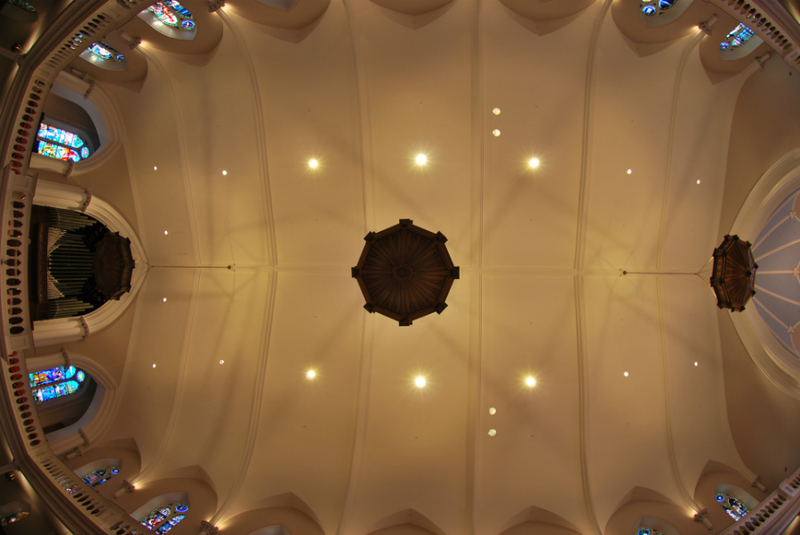 The church chose to invest in LED fixtures for greater efficiency, reduced maintenance, and the power-saving benefits that they offer. The entire lighting system was also integrated with a new emergency lighting system for added safety. 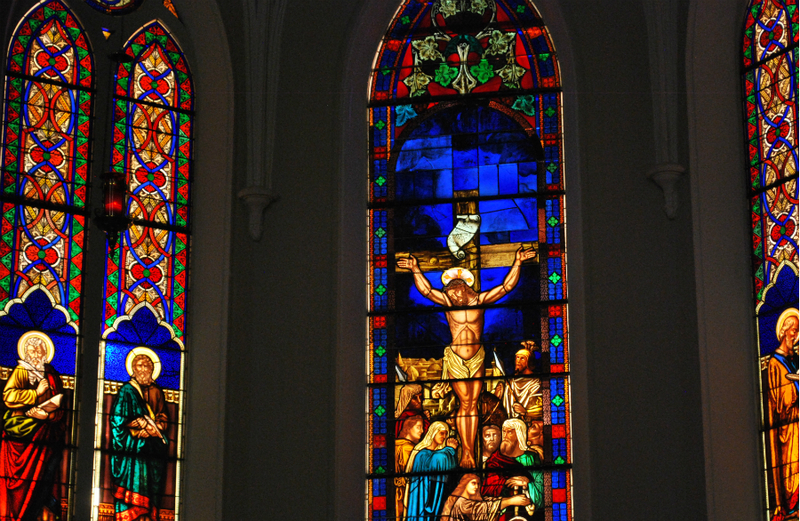 Philips Color Kinetics Blast fixtures were used to backlight the stained glass windows behind the altar, as well as light the steeple, belfry, and interior architecture of the altar. To illuminate the courtyard in front of the church, a Texas-based manufacturer was used to create antique-looking lamp posts to match the existing posts. 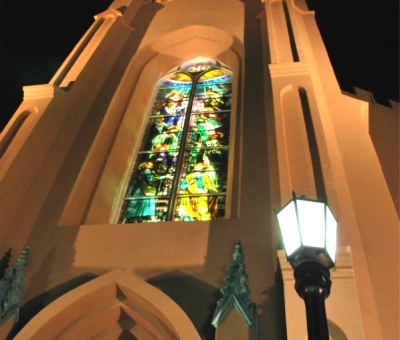 The Blast fixtures were mounted to these as well to light the front façade of the church. 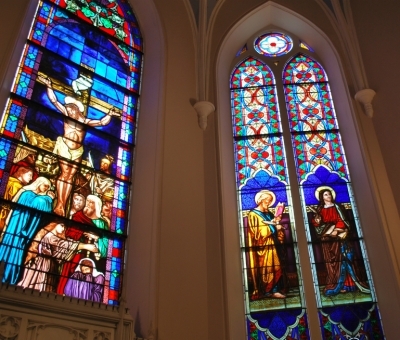 LED troffers and tubes were used to backlight the stained glass window facing King Street. A custom rigging apparatus was built to mount the LED fixtures behind the organ. 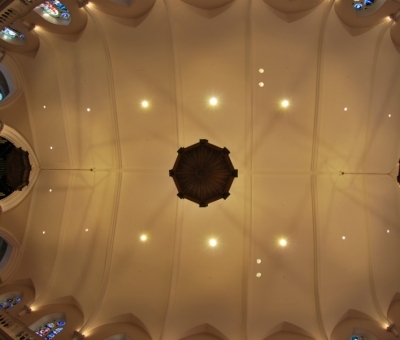 Sixteen fixtures from The Light Source were used to illuminate the congregation from the forty-seven foot high ceilings. Four additional units were mounted in each of the goblet chandeliers to create a soft uplighting effect, controlled by a wireless DMX transceiver from City Theatrical. Power was fed to the chandeliers with a cable reel from Conductix. 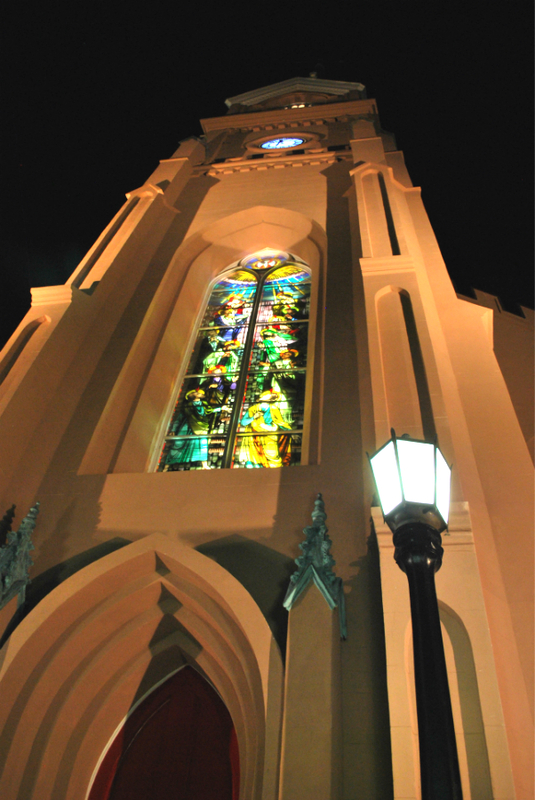 Philips Color Kinetics Burst fixtures were mounted at the tops of the interior columns to accentuate the steep angles of the Gothic architecture. ETC Source Four LEDs shoot through City Theatrical ceiling ports and serve as front lighting for the altar and pulpit. These fixtures generate rich, saturated colors as well as color-changing effects far a range of spot and floodlight applications. To tie the whole project together, an ETC Paradigm Architectural Control System was installed, including one touchscreen and several button stations. 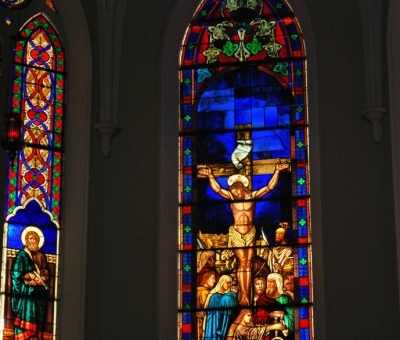 The interface was designed to look and function in a manner similar to the church’s old panels, providing a sense of familiarity to the end users. 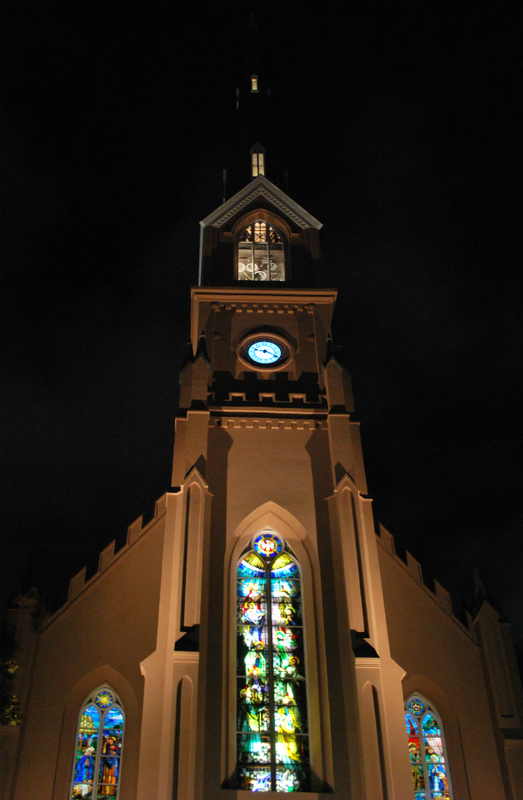 Paradigm’s astronomical time clock features were called on to provide control of the exterior lighting. 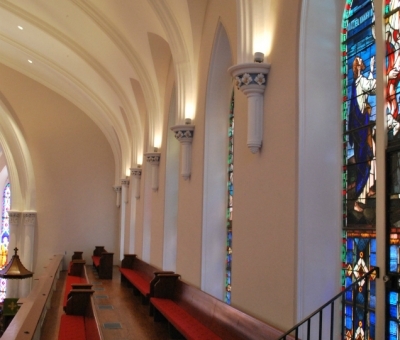 In 2015, the total renovation was completed to the delight of church parishioners, staff, and the public. 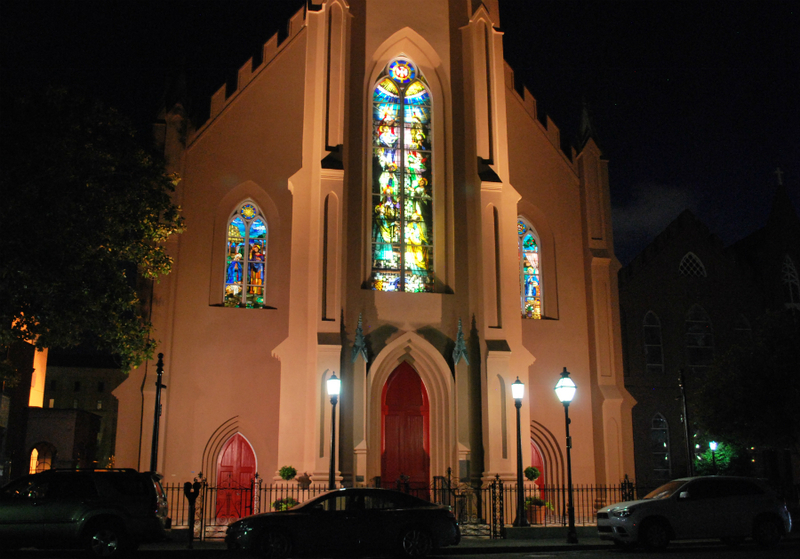 The investment in LED lighting as well as upgrading both the lighting and rigging systems ensures that this Charleston landmark will have energy-efficient, safe, and easy-to-maintain systems for many years to come. Productions Unlimited, Inc. is proud to have been part of this magnificent renovation.